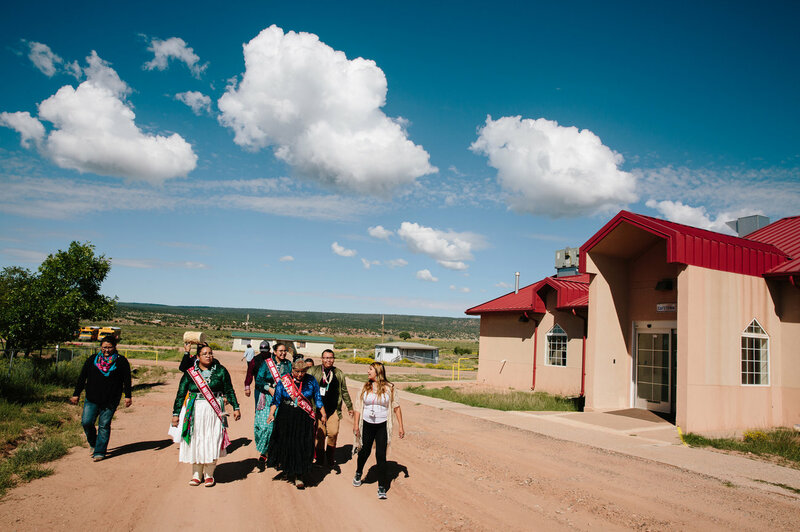 November 13, 2018 / Modified nov 13, 2018 1:25 p.m.
Miss White Mountain Apache Queen 2018-2019, Zipporah Lupe, greets Miss Navajo contestants as they stage for the parade at the 77th Navajo Nation Fair in Window Rock, Ariz., in September. Beauty — or Hózhó to the Diné, or Navajo, people — symbolizes living in harmony and balance with the earth, the spirits in the plants and animals, with the sky and with each other. So it's fitting that the Miss Navajo Nation pageant is a weeklong celebration of the Beauty Way in many aspects of a woman's life. Contestants must be at least 18 years old, unmarried, a high school graduate and able to speak the Navajo language, called Diné Bizaad. 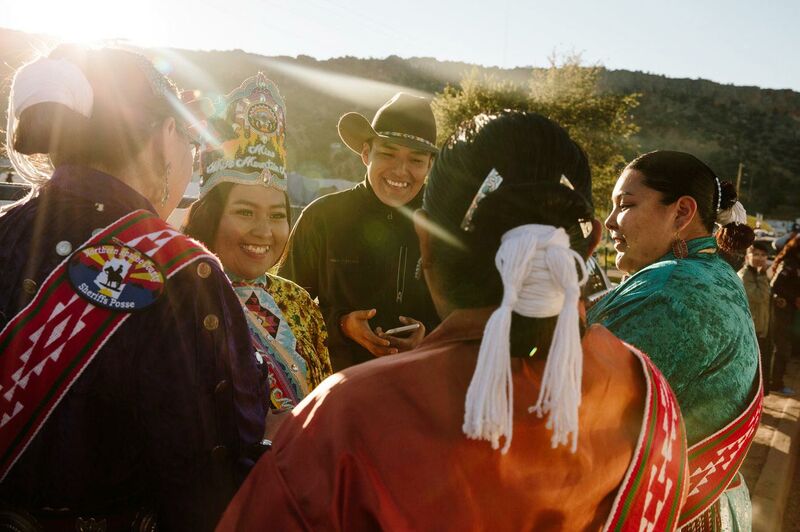 "Hózhó is also living the Diné way of life: culture, tradition and language," said 2017-2018 Miss Navajo Nation Crystal Littleben. "Hózhó represents that overall balance of everything. Negative and positive." Miss Navajo Nation contestants (from left) Kayla Martinez, 23, of Window Rock, Ariz.; Summer Jake, 25, of Goat Springs, Ariz.; and Autumn Montoya, 21, of Torreon, N.M. 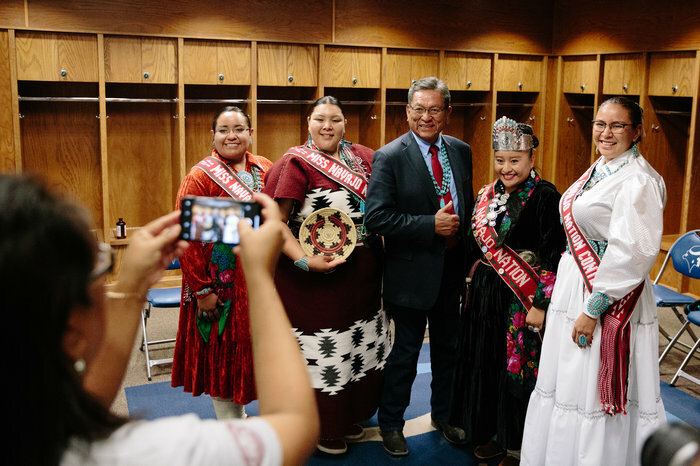 Inspired by female Diné deities, winners of the Miss Navajo Nation pageant exemplify the many roles Diné women play in their matrilineal society. 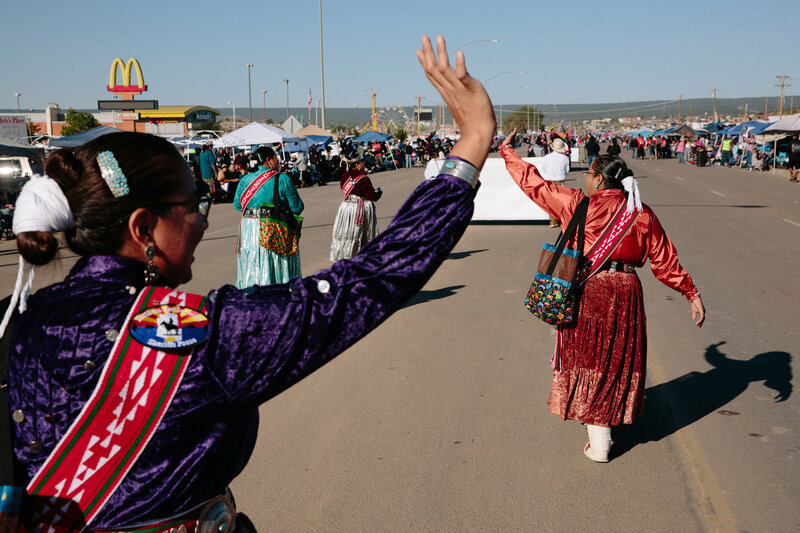 They will be goodwill ambassadors, lead community initiatives and help preserve the teachings, language and culture passed down to them from their mothers, aunties and grandmothers. This year, Summer Jake, 25; Autumn Montoya, 21; and Kayla Martinez, 23, competed in the 65th Miss Navajo Nation pageant. Like many others of their generation, the three contestants are not fluent in the Navajo language. Many generations of older Diné people were forcibly removed from their families and placed in settler boarding schools, where they were forbidden from speaking their language and practicing their traditions. 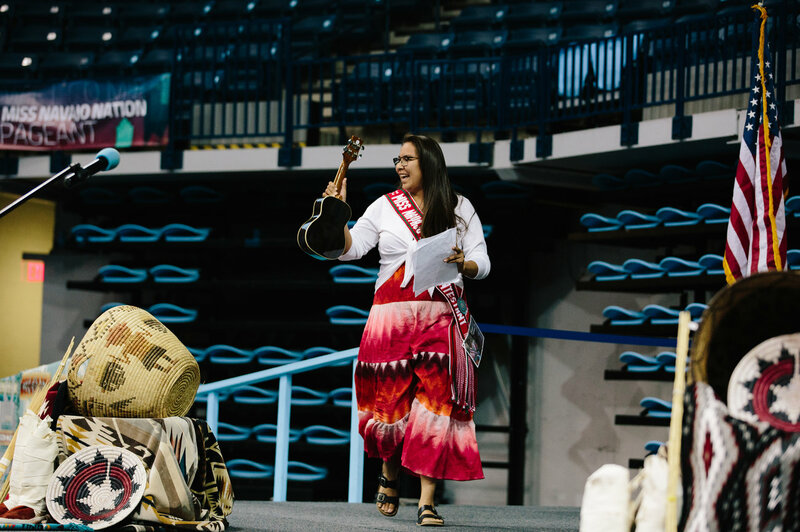 All three contestants pledged that language revitalization was a major goal of their platform. 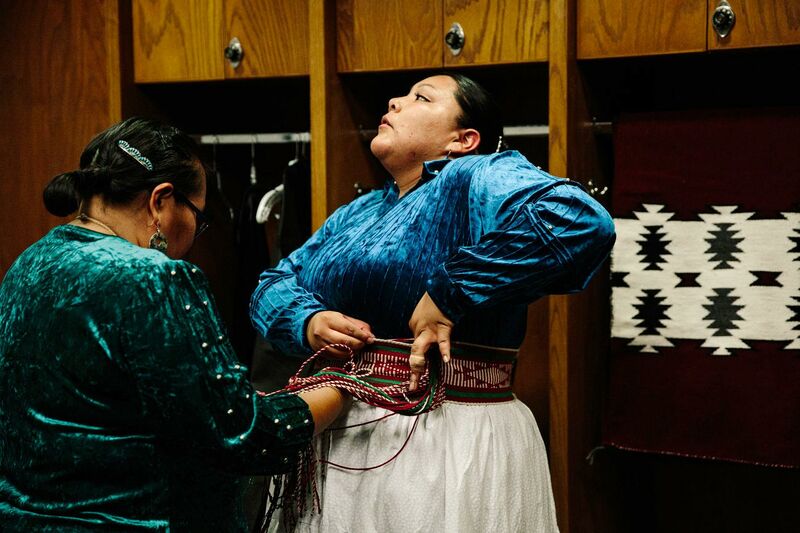 Montoya tightens her sash belt with the help of Miss Navajo Nation adviser Roberta Diswood in the women's locker room. "Our language is strong. It's healing, it's sacred and it's worth preserving for generations to come," Jake said. "I want to become fluent so I can teach my kids and hopefully my grandkids." During the competition, the contestants demonstrate traditional skills such as sheep butchering, food preparation, tying a tsiiyéeł (traditional hair bun) and answering impromptu questions in both English and Diné Bizaad. 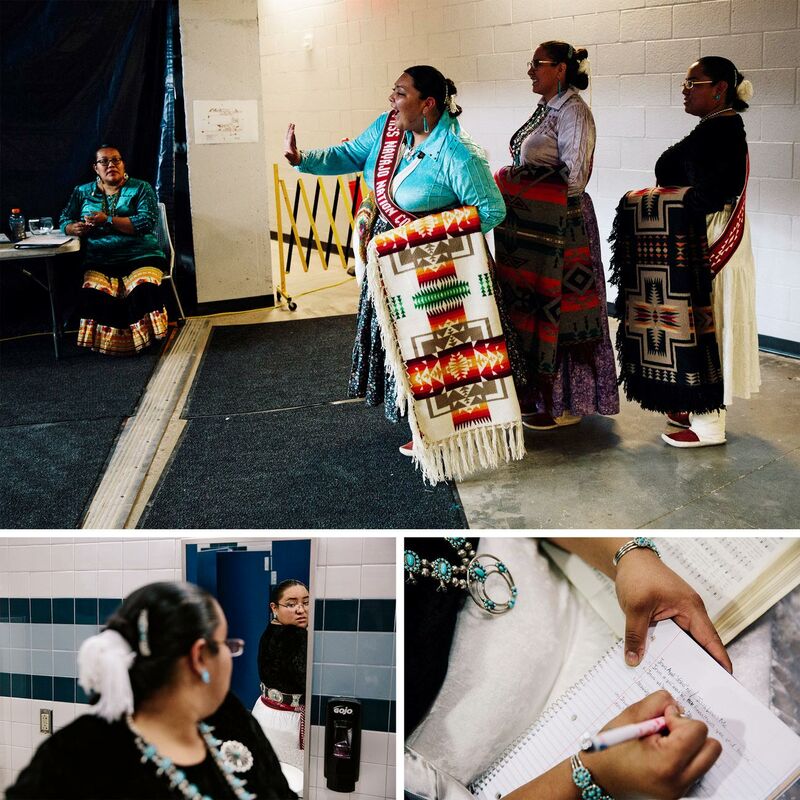 Contestants also conduct business interviews, perform contemporary talents and present a platform of how they would use the power of the office to encourage holistic health, promote Diné language and songs, advocate for victims of domestic violence, and bring awareness to missing and murdered Indigenous women. These photos show a glimpse of the marathon competition. (Top) Montoya waves to someone in the crowd as she stands backstage with fellow Miss Navajo Nation contestants. (Left) Martinez checks that her silver and turquoise belt is aligned over her sash. (Right) Martinez transcribes the song "Jesus Loves Me" into Diné before performing her traditional talent portion of the pageant. Miss Navajo Nation 2017-2018 Crystal Littleben, along with Jake, Martinez and Montoya, tours the St. Michaels Association for Special Education. 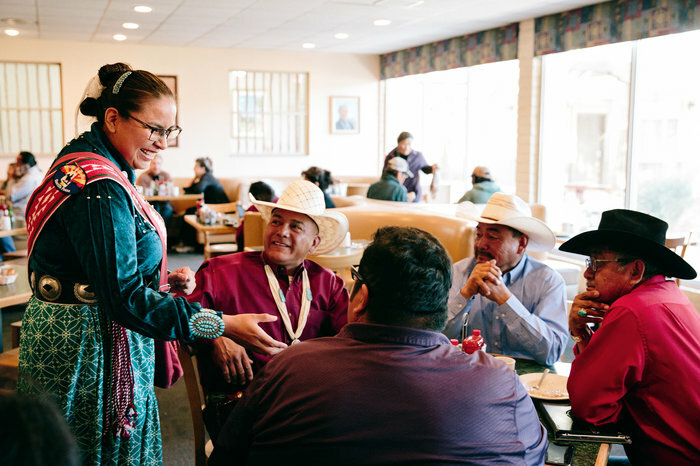 Jake meets with community members at the Diné Restaurant in Window Rock, Ariz.
Jake takes the stage with her ukulele to perform during the contemporary talent competition. Jake (left), Martinez (right) and Montoya (center left) walk in the parade with Littleben (center). From left: Martinez, Montoya, Navajo Nation President Russell Begaye, Littleben and Jake take a photo prior to the coronation ceremony. The Office of Miss Navajo reports to the Office of the Vice President of the Navajo Nation, making the position a highly coveted leadership and ambassador role. 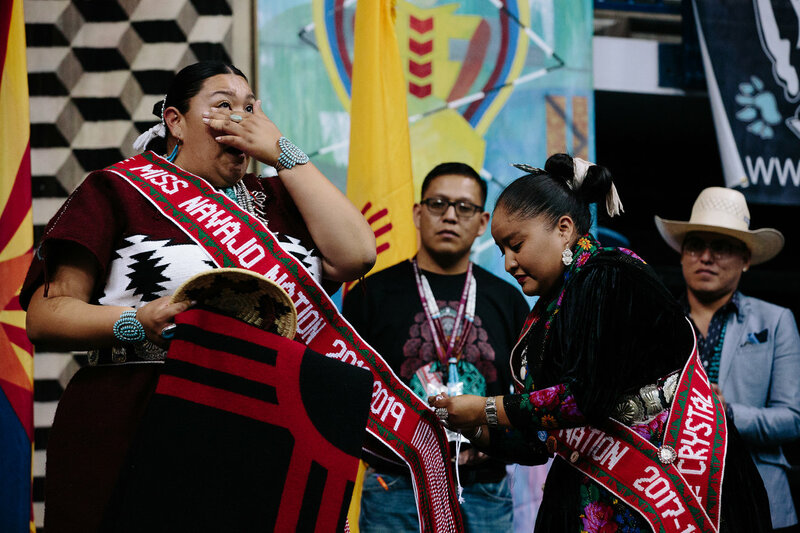 Montoya, Miss Navajo Nation 2018-2019, has her sash pinned on by Littleben, the outgoing Miss Navajo Nation. 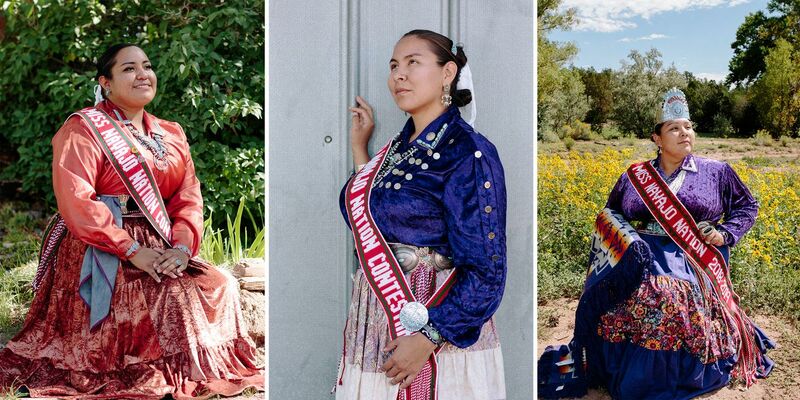 Montoya is the first Miss Navajo in 10 years from the Eastern Agency of the Navajo Nation and represents their unique stories, tradition and dialect. 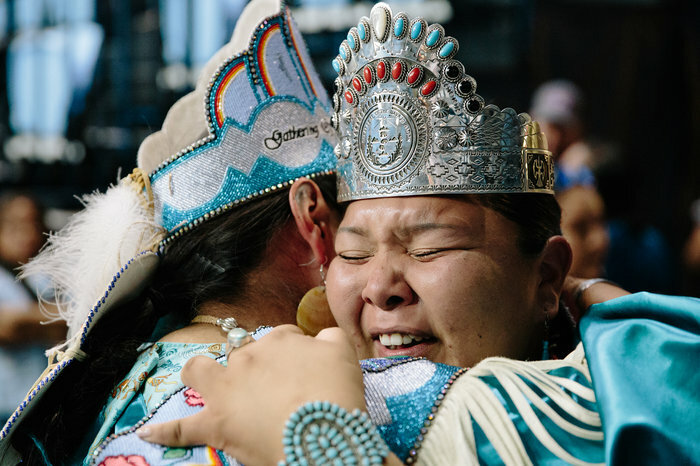 Montoya (right) hugs 2018-2019 Miss Indian World Taylor Susan after the coronation ceremony. Catilin O'Hara is a documentary photographer based in Phoenix.